You’ve seen the commercials and watched all the uber-happy parents at the dining room table with their picture-perfect kids: family game night is a must! It really can be as joyous an occasion as those cheesy ads make them seem. But what games are best to play with your kids? That’s a tough question. We vote that you focus on card games, for now, keeping it simple so you don’t get overwhelmed with too many options. There are so many reasons why playing card games with kids is a brilliant idea, and there are oodles and oodles of card games to choose from. We’ve narrowed it down to six card games that we believe you really should try to play with your young ‘uns. Give these 6 best card games for kids a try! This classic has been a family favorite since the early 70s. 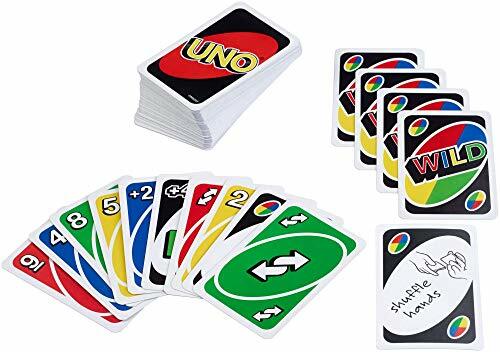 Invented by a barber named Merle Robbins, Uno is a game where players must match cards based on their color or number, similar to Crazy Eights. The game ends when any player runs out of cards in their hand. There are a few surprise cards thrown into the mix, though, like a “Pick Up 4” card and a “Skip Your Turn” card, that can cause emotions to run high! Just look at this YouTube compilation of kids playing Uno. They can get pretty excited! … and upset. Oh boy. Because it’s essentially a matching game (number or color), this is an easy game for kids to learn. It’s recommended for kids ages 7 and up, but it likely could be played with kids younger than this, as long as they can recognize colors and numbers. The tricky part (as seen in that YouTube clip!) is that kids often get upset when things don’t go their way, so the “Pick Up 4,” “Pick Up 2,” Skip Your Turn,” and “Switch Direction of Play” cards can incite drama. If we’re being honest, though, adults can get just as frustrated by this game as kids! Perhaps the biggest reason this card game is the top of our list is that it appeals to both adults and kids. It’s easy for kids to learn and play, but also still fun for adults to enjoy with them. There are also many versions of the game, including Harry Potter, Disney’s The Incredibles, Minecraft, Super Mario Brothers, Jurassic Park, and Emojis. It’s also available in extra large cards, which might make it easier for some kids – and adults! – to handle the cards. A classic game that’s available to buy almost anywhere. Simple concept is easy to teach new players. Extra “wild” cards can frustrate smaller kids. Spot It was released in 2009 and over 12 million copies have been sold across the world since then. Teachers use it, speech and occupational therapists recommend it, and kids love it. The concept is simple: there are 55 cards in the deck, each with eight symbols pictured, and players must flip their cards and find the matching symbols. There is only one set of matching symbols between any two cards, and the first person to find the match wins the card. The symbols are both funky and adorable. Tiny blocks of cheese, leaping dolphins, purple handprints with an eyeball in the middle… they’re pretty memorable! Again, the packaging says that this game is designed for kids ages 7 and up, but it could be played with younger ages. Problems can arise if the young players get upset when another player is consistently faster than them. So, while it’s good for developing vocabulary, perception and matching skills, etc., it can be frustrating for kids still learning to follow directions, taking turns, and socializing. There are several variations that can be played with the original card deck (4 variations, according to the package directions), but they all involve being the first person to spot the matching symbol. Not only does each set have different play variations, but there are also several different versions of the game available for purchase. 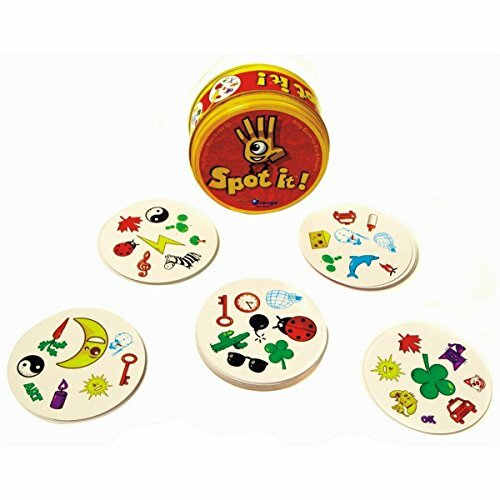 Some of the most popular versions include Spot It! Camping, Spot It! MLB Edition, Spot It! Mini Holiday Tin, and even Spot It! Sofia the First. Great educational tool that hones hand-eye coordination and vocabulary skills. Can be played by young and old kids alike. Several unique variations of play. Can cause younger, slower-to-respond kids to become easily frustrated. Creator Matt Kirby developed and “published” the game Apples to Apples back in 1998 and the game has had booming success since then. It’s a game of comparisons, really: one person plays a green card – which has a descriptor word, like “sharp” or “affluent” – and others much choose a red card from their hand – usually nouns or verbs, like “Pillsbury Doughboy” or “skiing” – that best matches, complements or describes the green card. The best match/complement/description wins the round! This game can be especially funny as people try to defend their card pairings and explain their rationale! It’s a simple concept, so younger kids and new players can all learn quite quickly, and there’s very little reading involved, so even kids with learning disabilities or who simply aren’t strong readers yet are able to play. Since each person gets a turn as the “Judge,” this game offers a fun way to teach little ones about patience and taking turns. However, there are many pop culture references and many cards with USA-specific references, which make it tricky for those who don’t watch much television or who live in other parts of North America. Also, the base game itself isn’t particularly well suited to younger kids as the topics and words are not always familiar. The base game box recommends it for only players ages 12 and up, but there are several versions aimed at even younger players. There’s an Apples to Apples Junior edition, Apples to Apples Bible edition, Disney Apples to Apples, and many others. 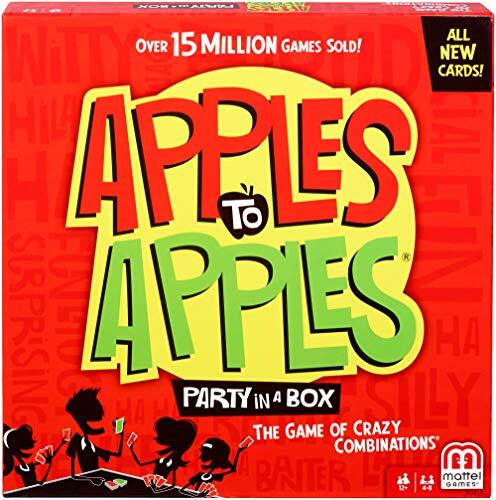 The Apples to Apples Big Picture edition is a recently released version where all cards have pictures instead of words, adding a whole new level of craziness! Word pairings can be extremely funny for all players. Taking turns as “judge” means everything is fair. Several game versions available for younger kids, etc. Base game contains words not easily recognized by young children. Pop-culture references not great for kids who don’t watch much tv, etc. Just when you thought Monopoly was a completely classic game that never changes, your kids bring home a copy of Monopoly Deal to blow your mind. This form of “Monopoly Lite” came onto the scene in 2008 and is much more simple in both packaging and play than the original. Each player has a handful of cards and must use them to purchase, trade, steal, etc., in order to collect 3 sets of properties in different colors. It’s so simple, in fact, that the box boasts that it can be played in only 15 minutes. This game is particularly well suited for kids as it doesn’t take nearly as long as the original Monopoly board game, but the concept is similar and familiar for those who do love the original. It’s also convenient that it doesn’t involve all the various unique, small game pieces of the board game – pieces that often get lost or confuse smaller children. While there aren’t any different versions of the game for young kids or versions with fun cartoon characters on them, the timelessness of the Monopoly name speaks for itself. Sometimes, if a game really does take only 15 or 20 minutes to play, older kids may get bored with this game. For the same reason, though, its an excellent choice for young kids with short attention spans. Simple concept is easy to learn. Often only takes 15 minutes to play. Very similar to the board game but has fewer pieces to keep track of. Short play-time can make it monotonous. 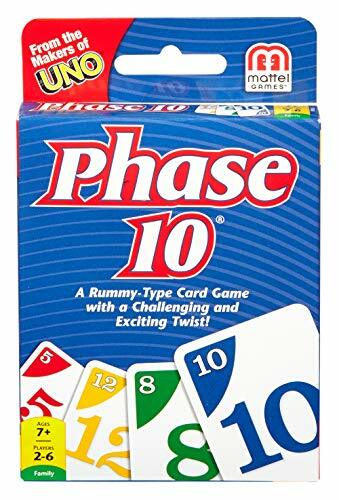 The game of Phase 10 consists of 10 phases (as you might expect), with each phase requiring the player to draw cards and collects sets (same numbers), runs (numbers in sequence), or colors. Once a player completes a phase, points are counted and a new hand is dealt. When someone completes all 10 phases, the game ends. There are “wild” cards and “skip” cards too, which add extra difficulty – or help, depending on whether you’re on the receiving end or not! This is a great method for teaching kids to strategize. They need to pay attention to which cards their opponents are discarding and picking up so that they can plan their own moves accordingly. The box recommends it for kids ages 7 and up, but you may find that kids under 10 have difficulty keeping up with this game. It can be hard to keep track of the required phases, and they can easily get frustrated when others play “skip” cards against them, or when a round goes long. To help with this, there is a kids version of Phase 10. In fact, there are several kids versions: Marvel Heroes Phase 10, Sesame Street Phase 10, Yo Gabba Gabba Phase 10, etc. There’s even a version that involves dice instead of cards. It seems as though the creators have done everything they can to make this card game appealing to kids of all ages. Teaches matching colors and numbers. Fun for kids and adults too. Kids can forget which phase they’re “on,” so extra help may be required. When it emerged in 2015, Exploding Kittens became the most-funded Kickstarter project ever. That says something! The base concept is simple because all you do is draw cards and hope you don’t get an Exploding Kitten card – you’re out if you do! You can use a “defuse” card to put out the explosion and stay in the game, or use any of the special cards that allow you to peek at the deck, to steal cards, to reshuffle the deck, etc. It’s cutthroat! Kids love this game! Most kids think the title is hilarious, therefore the game itself must be awesome – and they’re not wrong. Despite the title, the game is not offensive and does not actually promote harming animals as everything is cartoon-like and completely over-the-top. The rules are simple, and although they may find it tricky to understand the first time, subsequent games are easy. 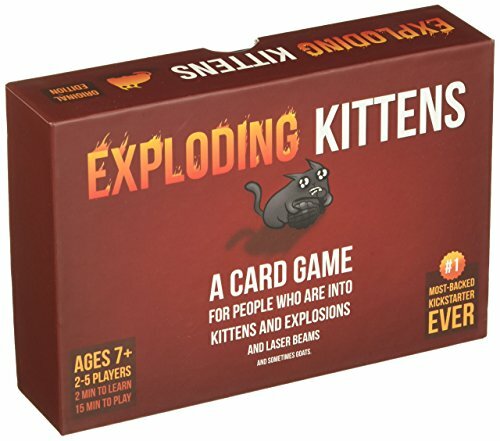 It may not be a good idea for particularly sensitive children, for although everything is cartoonish and silly, there are still cards where cats explode! Make sure not to buy the NSFW version! Not only is it “not safe for work,” it’s definitely not appropriate for kids! There’s a Party Pack game option, which provides enough cards for 10 people to play, and there are expansion pack options like “Streaking Kittens” and “Imploding Kittens.” All are family friendly! Cartoon-like cards are unique and funny. Not suitable for extra sensitive kids who may be upset by the title or the “exploding” cards. Keeping this in mind, regular family game nights are a fun and easy way to encourage a break from screen time. Time with family is important for encouraging communication between parents and children, even between siblings. What kind of meaningful communication can happen during an evening of laughing, yelling, and uttering empty competitive threats, you might ask? You’d be surprised! Games are a great way to teach kids about sportsmanship. It really doesn’t matter if we win or lose, but losing gracefully is an important skill that they’ll be able to use throughout their lives. Having a competitive spirit is not necessarily a bad thing, but learning to put that aside and be happy for others’ successes. In fact, you might follow this advice and have two winners for each game: one who wins the game and one who wins at best handling the loss. Another benefit to playing games with family is that kids can practice things like vocabulary, math, and spelling. This blog post says how games played with a regular deck of playing cards can be great ways to teach math skills to kids. Even just letting them keep score is a simple yet effective way for youngsters to practice addition and subtraction. Sometimes even geography is covered during gameplay (Have you ever played Risk or Ticket to Ride? All about maps and geography! ), and general trivia knowledge is never a bad thing. Card games are particularly good for practicing numbers, colors, and even shapes. According to this article from Scholar’s Choice, honing these skills during family night can even lead to better report cards! So even if the kids lose the game, they win in the long run. Card games can be a great way for kids to connect with different adults in their lives too. Seniors love playing card games, anything from Crazy Eights to Canasta, and teaching their favorite card games to some of their favorite little people can be an incredibly bonding experience. The opposite can be true as well and little kids can enjoy teaching their favorite games to grandparents, aunts and uncles, parents, friends, whoever! There are few things that bring people together like tabletop games, and strong relationships help build children into strong, respectful, hardworking, and independent adults. Education is important, as is social interaction. The bottom line here is that having fun with your kids is just as important as teaching them life lessons. In fact, it IS a life lesson! Mattel is one of the most recognized names in the game and toy industry. They own many of the brands that our kids know and love, such as Apples to Apples, American Girl, Uno, and even Minecraft. They also create products for Disney and Pixar. The company was formed back in 1944, became incorporated in 1948, and created Barbie in 1959. This article from 2017 says that Forbes then valued the Mattel corporation at $8.5 billion. A huge competitor of Mattel’s is Hasbro, a company that owns a large piece of the toy-and-game pie: Nerf, My Little Pony, Transformers, Monopoly, and Magic: The Gathering are all created by Hasbro. It was on the list of the World’s Most Ethical Companies (as named by Ethisphere Institute) for the last seven years, and in 2018 it ranked fifth on the 100 Best Corporate Citizens list (by CR Magazine). According to Forbes, this company was worth $12 billion as of May 2017. Gamewright makes a wide array of both card and board games for kids, including Sushi Go, Too Many Monkeys, Rory’s Story Cubes, and In A Pickle. It’s a family company, founded in 1994 by a group of parents looking for quality games for their families, and have grown to now have a collection of over 150 different games. They are a division of Ceaco, who make jigsaw puzzles, and a sister company to Brainwright and its collection of brainteasers and logic puzzles. Q. Where can I buy card games for kids? A. There are many different places and ways for you to purchase kids’ card games. Amazon is certainly the easiest option for purchasing and delivering your card games, and other online retailers include Best Buy and Walmart.com. Any department store or toy store will have an assortment of card games for kids, and checking out your local comic book store or game store is a great option. Q. How much do kids’ card games cost? A. The price of card games can vary considerably, depending on the individual game and where you purchase it. 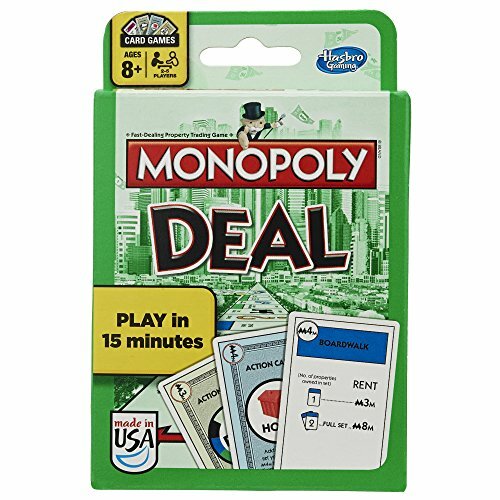 For instance: Monopoly Deal sells for under $7 through Amazon and is $7.99 at London Drugs; Apples to Apples is $17.28 from Amazon and $22.99 at Barnes and Noble. Amazon is your best bet for the best deal. Q. When can I start playing card games with my kids? A. Kids can play card games at very young ages! Really, it depends on the game and on the child themselves, but there are many card game options out there for kids ages 2 and up. Memory games like this Curious George game can be played by 2-year-olds, Old Maid can be played by 3-year-olds, and 4-year-olds can easily play this Pete the Cat Big Lunch card game. Q. Where is the best place to play card games with kids? A. The best place to play cards with kids is anywhere and everywhere! Playing card games at school is a great way to break up a day of focused education with some lightheartedness, playing card games at home with the family is a lovely way to spend quality time together… heck, even breaking out the card games at church, (such as this Apples to Apples Bible Edition) during Sunday School, of course, is a great place for card games! Q. How is playing card games different than playing board games with kids? A. Board games are also a fantastic way to spend quality time with your kids, but card games can sometimes be a better option. Especially when traveling, card games are smaller and contain fewer pieces than board games, so they are the more sensible option when packing for trips. Some card games can even be played in the car, while the majority of board games definitely cannot! It’s also often easier to teach card games versus board games to small children as there are fewer tiny, complicated pieces involved. With all of this information, finding great card games to play with your kids should be a cinch, no matter what age they are. There is such a wide range of games available, from simple to strategic, from Disney-themed to sports trivia, that you’re all but guaranteed to find a card game that will suit everyone in the family. It’s easy to choose the best card games for kids with our list! Consider card games as a simple yet effective method of connecting with your loved ones. Just as playing Skip-Bo with grandma or a Memory game with your 2-year-old, using cards featuring Spongebob Squarepants, the quality time spent together while playing is priceless. Whether you have an ulterior motive and are trying to get your kids to practice their math skills while keeping score for Dutch Blitz, or if you are testing to see if your child is colorblind by watching them closely during a game of Uno, if you’re together and you’re having fun, it’s quality time well spent! If you’re at a family reunion and things are getting awkward, play a card game with the kids. If you’re with a loved one in a medical waiting room, anticipating life-altering news, break out a card game to dispel the tension. If you’re hosting a birthday party for a dozen 6-year-olds and they’re all hopped up on sugary treats, introduce them to a new card game and have them eating out of your hand. Card games for kids are where it’s at!